Remember all the cliques in school? The nerds, the jocks, the popular kids? 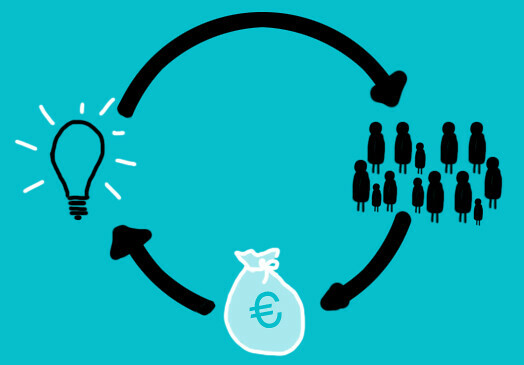 There is a crowdfunding campaign for every crowd and any thing. Whether you get excited about NASA sending a probe to Mars or how Lewis Hamilton and his Mercedes AMG do in the next Formula 1, there's a cool crowdfunding campaign for you on Kickstarter. Mars City Design hopes that Mars will be colonized, and are designing sustainable cities. Every September adventurous people from Carnegie Mellon, NASA and MIT get together at USC to collaborate. Even Buzz Aldrin, the second man to walk on the moon, attends this annual event. By pledging US$150 to the crowdfunding campaign, a sci-fi fan can get a day with these space enthusiasts. For US$500 they can hang out for a whole week. The very first AI personal trainer is the Vi. It has biological sensing ear-buds, automatic workout planning and monitoring, and even responds to voice commands. For US$199, you can have one of these pioneering gadgets. Venture Automobiles are running a crowdfunding campaign to build an electric car capable of 400mph. A US$100 pledge gets you the thrill of knowing you are contributing to zero-carbon super-speed - and a Venturi t-shirt to prove it. Who ever thought that a knife could be so deliciously beautiful? The Bulat has an ergonomic hardwood handle and a high-carbon folded steel blade. It is not only extremely effective, but also so good looking it seems more like a piece of art than a kitchen utensil. At US$100, this eye-catching tool is around half the price of comparable knives, and you are contributing to further development of equally functional and aesthetic products. Crowdfunding has been responsible for a huge resurrection of table-top board games. CoolMiniOrNot, who have run some of the most successful crowdfunding campaigns of all time on Kickstarter, have recently brought a revamped version of the old Dungeons & Dragons concept called Massive Darkness. For US$120 you get all sorts of freebies. Whether it’s the ‘cool factor' or not, all these campaigns have been wildly successful and pledges continue to grow. Maybe this shows that there is a fun side to business, and especially to crowdfunding.